Glucosinolates, the latest volume in the Advances in Botanical Research series, presents in-depth and up-to-date reviews on a wide range of topics in the plant sciences, with this edition focusing on glucosinolates. The individual chapters cover all aspects of glucosinolate research from biosynthesis, degradation, regulation, and ecology, to the mechanisms of their health benefits. 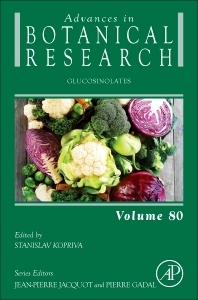 The chapters are written by the world leaders of glucosinolate research. Prof. Dr. Stanislav Kopriva holds the Chair of Plant Biochemistry at Botanical Institute of the University of Cologne and is a deputy speaker of the Cluster of Excellence on Plant Sciences (CEPLAS).